In my earlier post “How to Manufacture Love” (read by 92,880 PT readers) I discussed Arthur Aaron‘s 1997 amazing manufacturing love experiment. Aaron designed a 45 min procedure that can induce love within randomly matched couples seeing each other for the first time. The procedure starts with the exchange of answers on 36 increasingly intimate questions, followed by four minutes of silent but intense staring into each other’s eyes. I also explained how the mechanism of commitment facilitates this synthesized love. The exchange of intimate information is like falling back into someone’s arms. It’s scary but once done it creates the most reliable signal of trust. Beyond trust, surrounding our secrets delivers a message of commitment, because it endows our counterpart with a certain degree of power over us, implicitly implying that we have a stake in making this date work out. In this post I’d like to discuss some of the practical implications of Aaron’s experiment, and my own insights on it. Dates last more than merely 45 min., and it would be wrong to start a date by implementing Aaron’s procedure by the book. Four minutes of silent starring at a restaurant’s dinner table may easily freak out your waiter, and probably also the soup he would be bringing to the table. But the essence of Aaron’s procedure can be transformed into some simple dating guidelines. These guidelines are very different from the “5 tips” lists you have seen in the past. 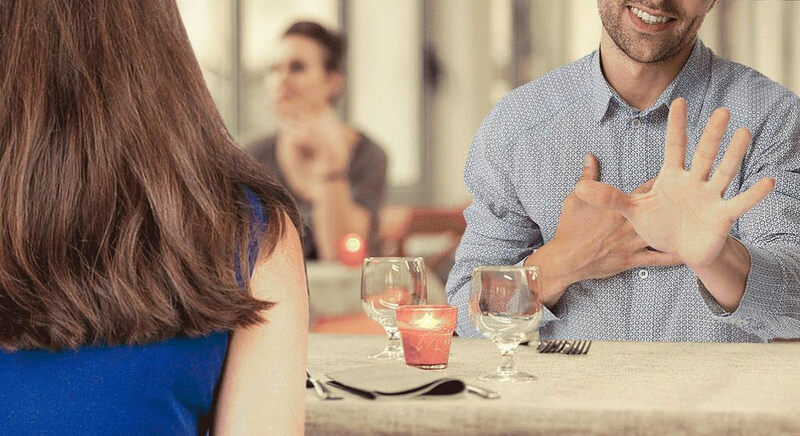 They are not about “dress to impress” or “make yourself smell good.” Most of these trivial dating manuals claim to be giving YOU (single) a strategic advantage over your partner. But a date is not a battle, it is a joint venture! Just like Aaron’s procedure, my guidelines can only work well if both parties adopt them alike. The best way to use them is as a bilateral treaty. You can put them on your online dating profile or send it as a suggestion to your date before you even meet. My five-item Re-guidelines read: Relax, Reveal, React, Reason and Rejoice. Relax! It’s going to be fine. You don’t have to be socially smart or rank high on emotional intelligence to do well on your dating. We were all endowed with certain dating instincts and skills by evolution. Otherwise, we wouldn’t have survived as a species. If birds and insects can do it, you can do it as well. To be able to relax never view a date as a crucial event but more as a lesson, an experiment or an experience session. One reason Aaron’s procedure work so well, is that subjects did not view themselves as daters but rather as participants in an experiment. Reveal yourself. Discuss those issues that matter to you most; hopes and fears, habits and aversions, strengths and weaknesses, highs and lows in your own biography. This will generate an effect similar to Aaron’s 36 questions, only that here you pose the questions and answer them at the same time. Like Aaron’s questions, you can allow these revelations to be gradual and responsive to the openness you are receiving from the other side. But regardless of your date’s openness be sincere. Daters often find it hard to be truthful. They tend to pretend themselves to be what they wish to be, rather than revealing who they really are. This is a natural courtship instinct, but eventually who you are will be revealed, and if your partner was hoping to date someone else, it is your interest that he or she knows upfront that you are not that person. React: Allow your date to reveal her or himself, and let your date’s inputs resonate in you. Respond to these revelations. If you find yourself locked in embarrassing pauses don’t worry to admit that you are nervous. The exchange of intimacy among total strangers is not easy. It requires substantial degree of emotional labor, but it is precisely through this labor that both parties can commit to one another that they are willing to give the date a chance. Reason: Dating is perceived as the territory of emotions, and daters often prefer to neglect reasoning. “This is how I feel and I don’t know why” is not good enough. If, for example, you feel offended by something your date said try to explain to yourself and to the other person where it is coming from. Leaving it ambiguous will signal resentment. As we argued earlier, dating is a joint venture. It is a collaborative project that needs to be managed, and it cannot be managed without reasoning. If things look good as the date progresses, it would help if you reason about a joint plan for subsequent meetings, how often they should take place, where, and how can you get the most out of these meetings. This brainstorming would give you the first chance to experience how it feels for you to do things together, and manage a joint project. And, what could be a better project than the formation of your own relationship? Rejoice: The success of a date is very much a matter of attitude. It’s an event of self-confirming expectations. If you enter it skeptical, it is bound to fail. If you show optimism, it is much more likely to succeed. Optimism would allow your natural Oxytocin to work extra time to generate a bonding state of mind. Even if you sense that it is not going to be it, avoid regrets. Rather than focusing on wasting your time focus on the experience and the extra learning that evening has offered you. Even if it does not save your date, it might well save your day. Aaron’s procedure for manufacturing love could help with your date.